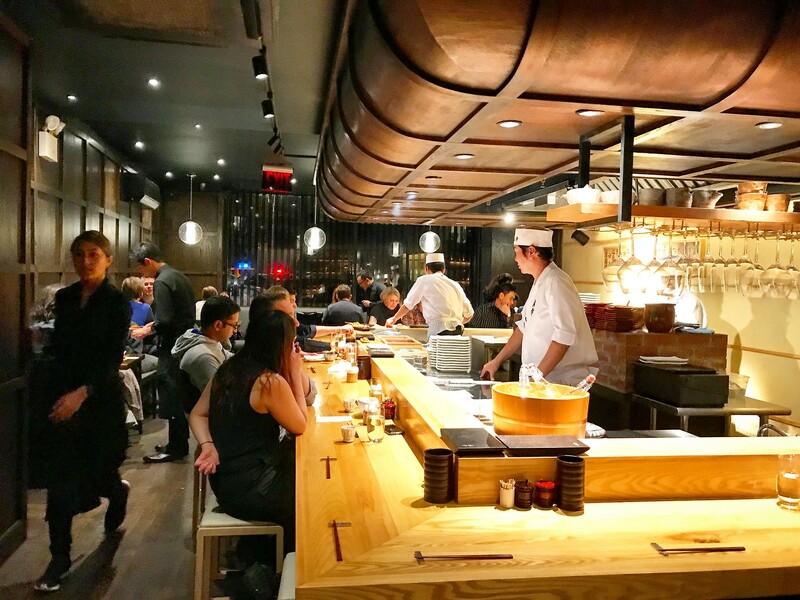 With so many great Japanese restaurants in New York City, it seems difficult to set up shop and stand out among all of the amazing options. 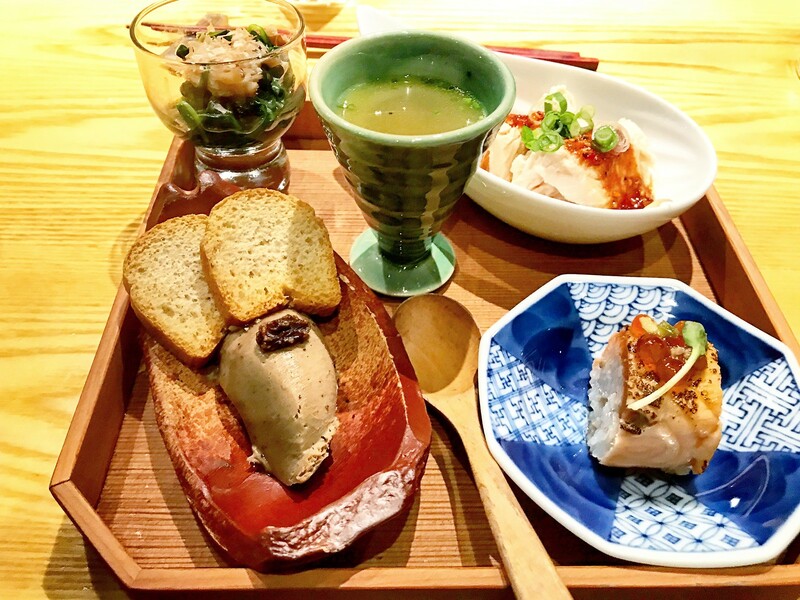 From sushi and ramen to fancy omakase set-ups, we thought we had seen it all. 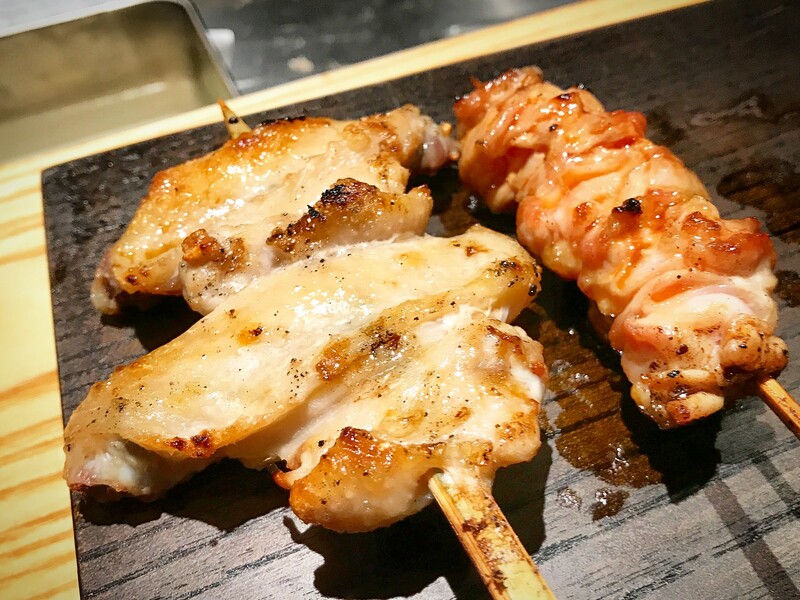 And then: Toriko NY opened their first US location in the West Village in late August, focusing on Japanese yakitori, or chicken skewers. 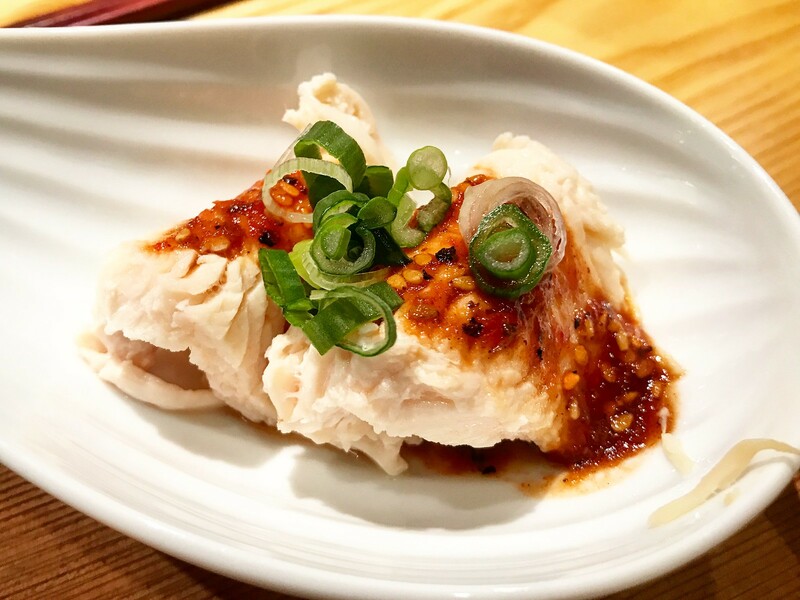 Popular in Japanese izakayas as a post-karaoke drinking snack, Toriko NY puts an elegant spin on an otherwise simple dish, and their 13 locations across Japan are popular destinations for both tourists and locals. 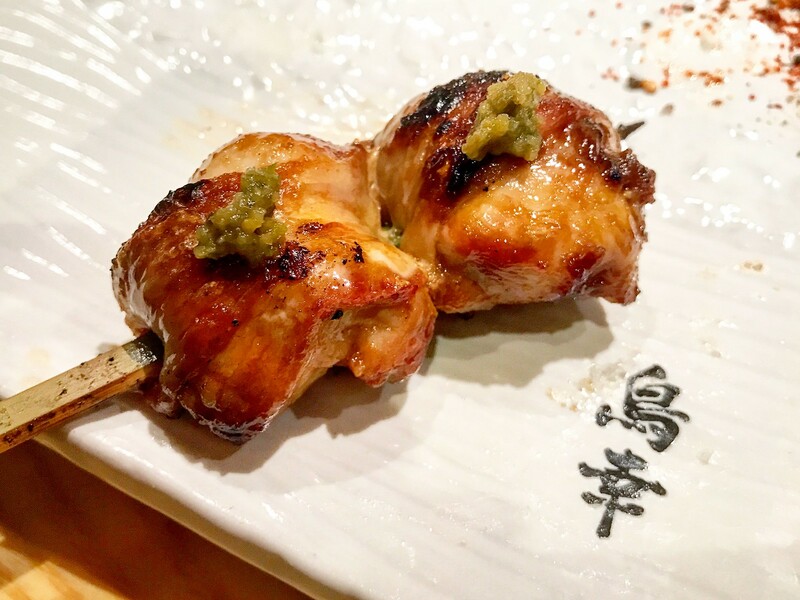 While there is an a la carte menu, Toriko is best know for their omakase menus which focus on grilled chicken skewers coupled with other amazing non-skewer-based dishes. 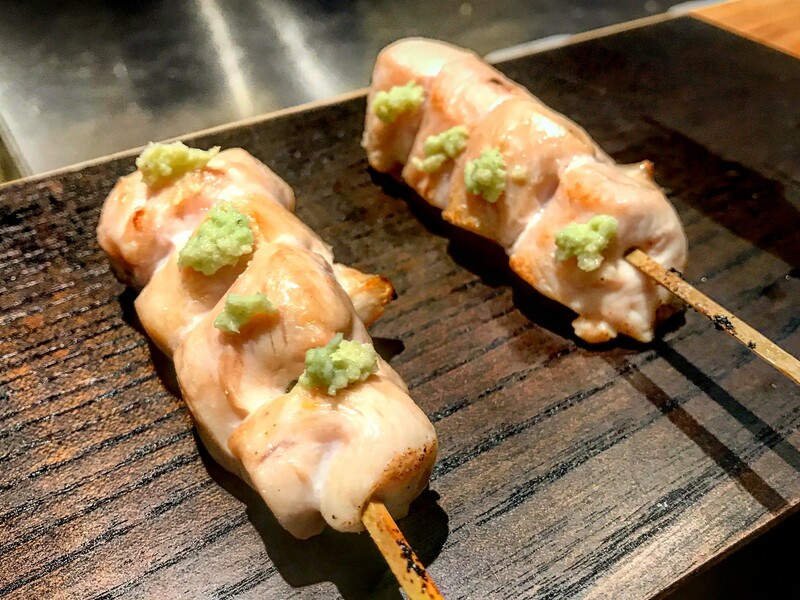 There are two omakase options, $65 and $85, and with either option you get your fill of chicken skewers. The skewers change nightly based on availability and the other dishes change seasonally, giving you an excuse to keep coming back. The grills are helmed by Executive Chef Shinji Odahara, a skilled butcher and specialist with 28 years of culinary experience, who also serves as the Food Director for the Toriko’s restaurants in Japan. 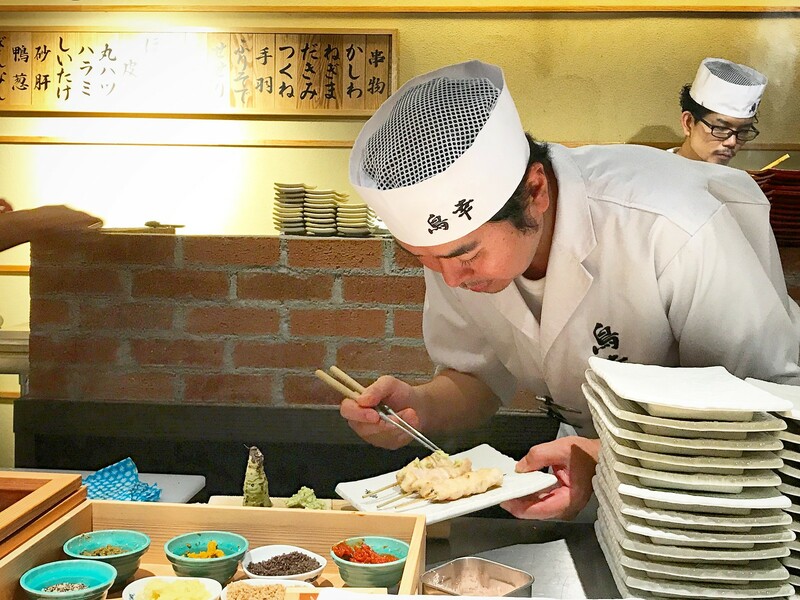 If you sit at the chef’s counter, you are able to see all the skilled chefs preparing your meal right before your eyes. We started with a tray of seasonal amuse bouche and soup. Out of the first five starter dishes, the chicken bone soup is hands down the fan favorite, hearty and full of flavor. Our waiter even tempted us by saying, “It smells as good as it tastes.” The other dishes included spinach and mushrooms, spicy chicken (which we were warned may be spicy, but really was not), an expertly prepared salmon sushi piece topped with roe, and the rich and smooth chicken liver mousse. Chawanmushi is another popular Japanese appetizer, a smooth and creamy egg custard dish that resembles extremely soft tofu. 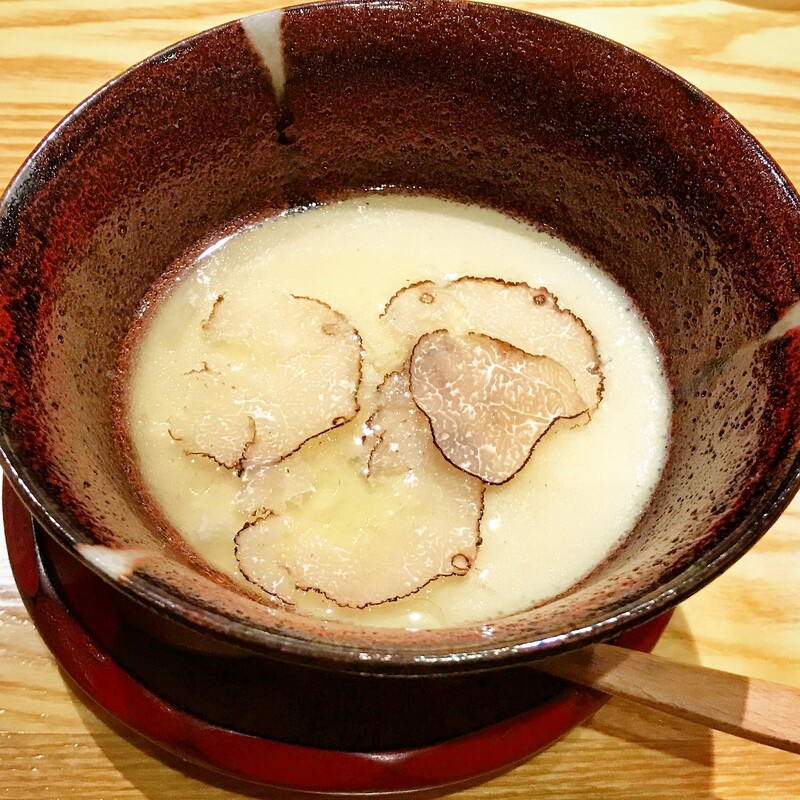 In this version the custard is infused with foie gras and then topped with thin layers of shaved truffle. Of course the star of the show is the yakitori. Both of the omakase options come with five chicken skewers and two vegetable skewers. A place card is laid in front of you with a diagram of a chicken and the parts where the skewers come from, but you are left to the choices made by the chef and the options change daily. You will probably start with something relatively “normal”, such as the chicken tenderloin topped with a little bit of fresh wasabi, or smokey breast meat topped with ginger, or the flavorful chicken wings. 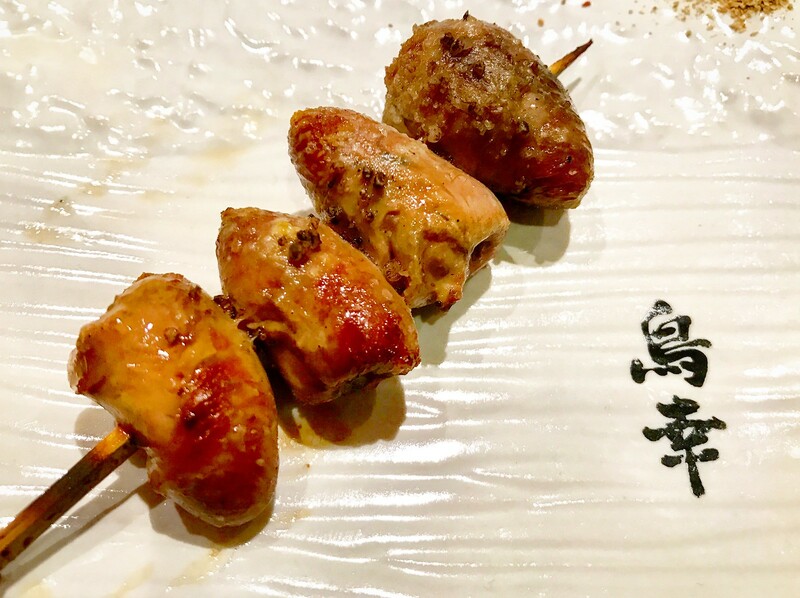 And you will probably try something new, as the skewer of chicken hearts (Maruhatsu), the gizzards (Sunagimo), or the tail (Bonjiri). Whatever the options, all are expertly grilled and perfectly seasons to match the flavor and texture of the different meats. 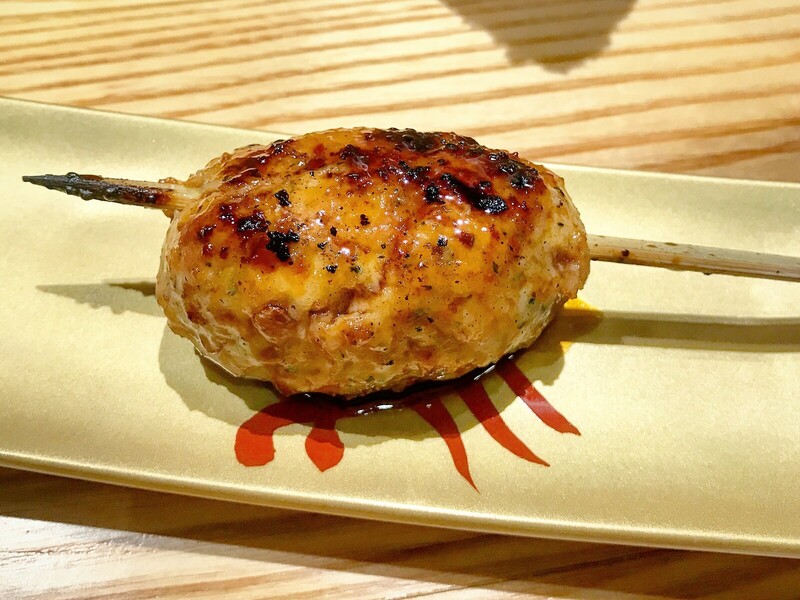 One of my favorite dishes was the chicken meatball, which is a very traditional Japanese dish and brought back a lot of great memories for my taste buds. The more expensive $85 omakase menu included an additional entree dish, of which the options are the Toriko Shio Ramen and the Oyako Don chicken and rice bowl. 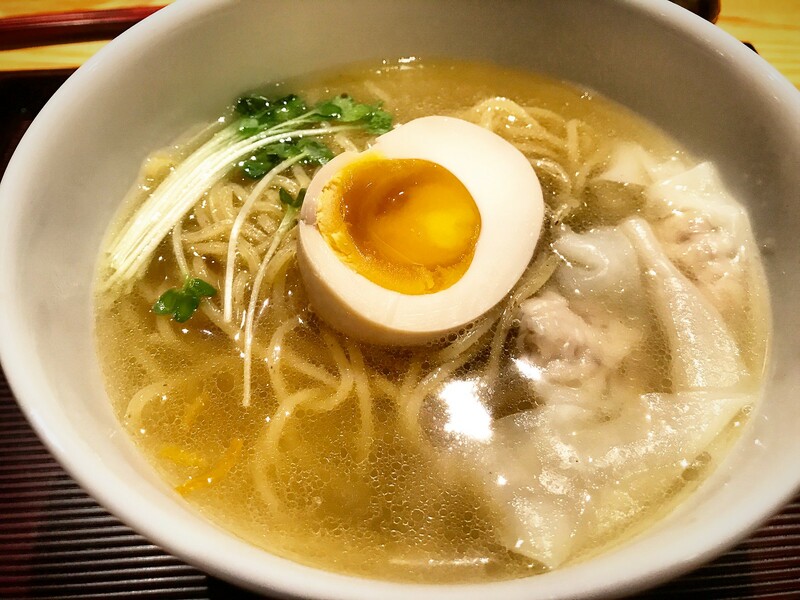 The Toriko Shio Ramen is made in the same broth as the amazing chicken bone broth from earlier, bringing the meal full circle. 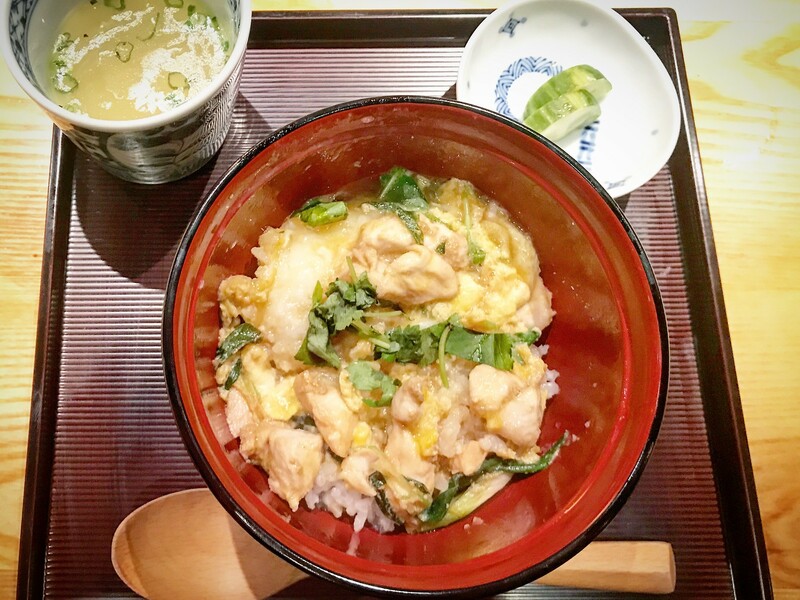 The Oyako Don was a great blend of chicken and egg, mild and comforting for a chilly evening. It also came with a small cup of the chicken bone broth, and pro tip: pour the soup into the bowl for a full-bodied chicken rice stew experience. I am honestly not sure if this is a regular practice, but it certainly should be. For a well-rounded assortment of yakitori plus other dishes, the higher tier omakase option will leave you full and satisfied. If you want your meal to be skewer based, I would recommend getting the lower tier of the omasake option, which does not include the additional main course dish and dessert, but leaves your more room to order additional yakitori skewers of your choosing off of the a la carte menu. 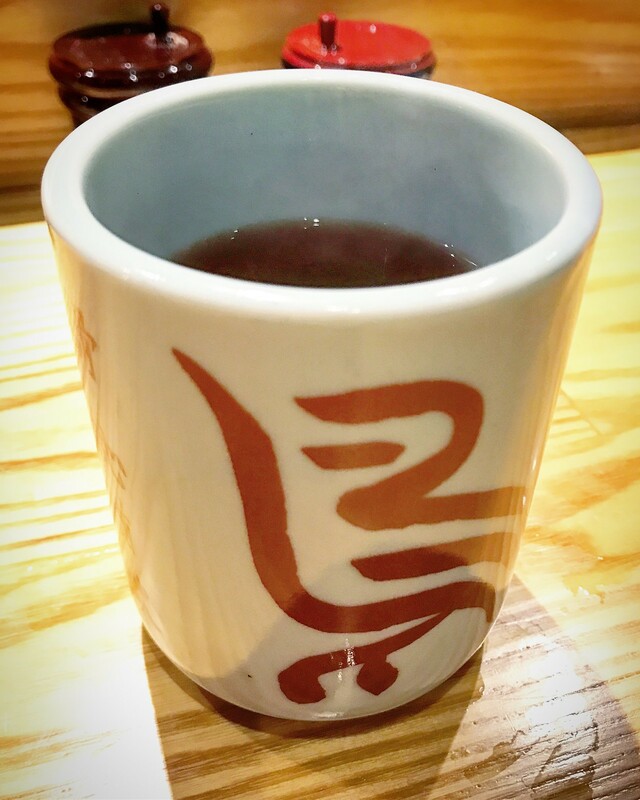 To accompany your meal, Toriko has an extensive French wine list, both domestic and imported craft beer options, and a Japanese-inspired cocktail menu. 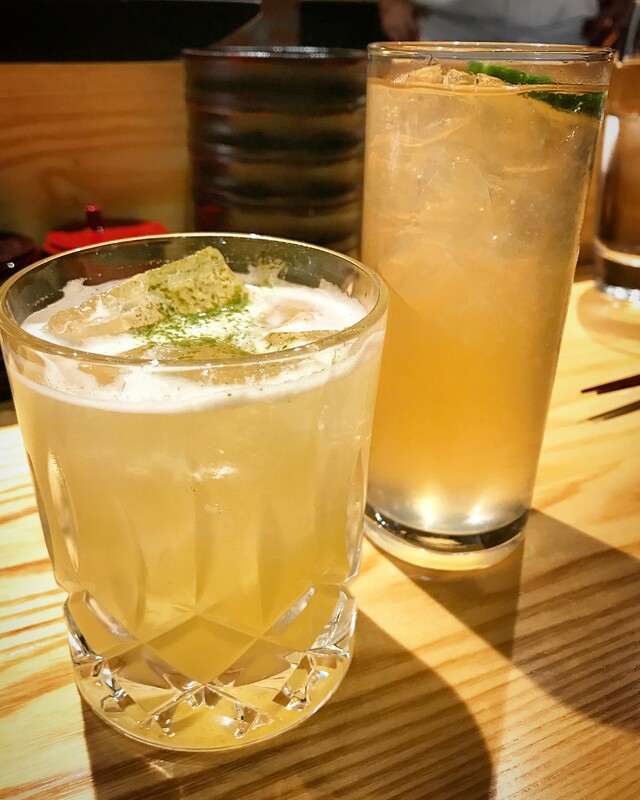 My favorite cocktail was the Noble Earth made with Nobushi Japanese Whisky, coconut water, pineapple juice, but for something light and refreshing I also enjoyed the Toriko Gin & Tonic with Elephant London Dry Gin, white grape juice, and Fever Tree Indian tonic. This is a great spot to take a date or to impress your friends who are really into chicken anatomy.